Sue Kessler is a New York based theater artist and producer. After attending Skidmore College, she became a member of the experimental theater company, Fovea Floods, and served as Company Manager for five years. In addition to her producing credits with the company, Sue also performed, directed, and composed music throughout Fovea Floods’ ten year career. In 2007, Sue co-founded The Bushwick Starr theater in Brooklyn, NY and helped transform it from a humble rehearsal loft into an Obie award-winning off Broadway venue that the New York Times heralds as a “boldly experimental home for artists” and Time Out NY calls “One of New York’s best-curated venues… Brooklyn’s hottest incubator”. 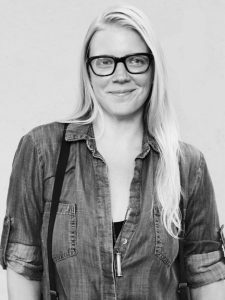 As Creative Director for the Starr, Sue strives to bring some of the most exciting contemporary performance artists to the stage in the vibrant community of Bushwick. Notable productions include: Suicide Forest by Kristine Haruna Lee, Animal Wisdom by Heather Christian, Miles for Mary by The Mad Ones, I’ll Never Love Again by Clare Barron, Ghost Quartet by Dave Malloy, RoosevElvis by The TEAM, and Blood Play by The Debate Society. The Starr is a thriving cultural institution rooted in its founding mission to nurture artists in creating their most ground-breaking work, while also exemplifying the idea that affordable, equal access art can obliterate boundaries of class and cultural divides, and that live theater is essential in preserving our generation’s ability to connect, engage, and participate in the present moment. Sue is the director of the Theater Management program at Skidmore College, serves as Associate Chair of the Theater Department, and is the Co-Chair of the Saratoga Springs Arts Commission. Sue has been a guest speaker at Bard College, Carnegie Mellon’s MFA directing program, The Orchard Project, and Henry Street Settlement, and served on various arts panels for organizations such as The Brooklyn Arts Council and The Public Theater’s Under the Radar Festival.